I started out at Longleaf not knowing if anyone else would be there. There were a few people including two that I know, Mike and Renee. We ran together about 3.5 miles to get to Craig and Diane's house who put out drinks for runners which everyone calls "the lemonade stand". 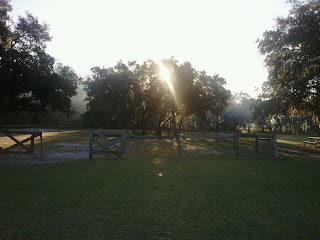 After that, continued on by myself into Starkey Park and headed towards the horse corral and beyond that to the off road trails. Feeling more familiar, but at the same time wanting to be careful not to accidentally extend my run, I took note of which trails I turned on and the landmarks I passed. I made it out to the power lines and thought how if I had more time I could turn left (head north) and keep running and running. It was such a nice morning. Although I had started out feeling chilly (low 40's) I was soon quite comfortable. Running through Starkey park, I often feel "cold patches" where the temperature seems to drop by about 10 degrees. I saw on the ground what looked like patches of frost. Thought maybe it was just the sun's reflection off the dew, so I reached down and found actual frost, kind of weird because I didn't think it had gotten quite that cold even with the "cold patches". Before I knew it I had gone 10 miles, it was a bit after 7:00 and I had to be back by about 8:00 in order to get Thomas to bowling at 9:00. Jenny had some early morning clients so I said I could take Thomas bowling. I don't want to stand in the way of Jenny's success at work and although she's doing awesome she is still in the building up stage. So, I didn't have to say yes but I wanted to say yes, and therefore I had to be back on time which meant I'd have to pick up the pace. So, I turned back and kept up a decent pace but was also a bit careful since I'm still very much a newbie when it comes to off road. Made it back to the horse corral and then was able to pick up the pace a bit more. Here's a picture of the horse corral. I didn't take this picture, but Chris H. did the next day when he ran with Jenny and Sean, but it's pretty much exactly what I saw, with the sun coming from the east lighting up the morning sky as you look back from where you just came. So, made it back just a bit after 8:00 and rushed back home. Later in the afternoon took my first bass guitar lesson while Thomas did his drum lesson. Learning something brand new always feels a bit intimidating in some ways, when you are totally clueless about it. But, that's part of the learning and growing. The instructor, Joe, spent some time getting it tuned up including adjusting the truss bar, then went onto show me some basics and the chords from Black Magic Woman by Santana. I've liked Santana for a long time ( I saw them once about 1987, and they were one of my first CD's I ever bought). So, it was a good song for me. 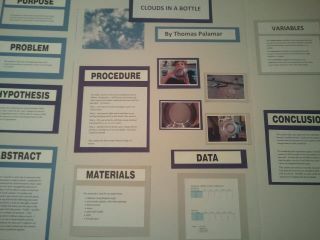 There was a bit more science fair work to do as I had kind of messed up on some of the tests. Redid them in a more methodical manner than when we worked on it last week. My pace for Saturday's run was a little faster than it should have been. Sammy was being snugly after Jenny left for her run with Sean and Chris. Jenny's run went pretty well considering how she was feeling on her last run. I was glad when she didn't come home early. She was hoping for 8-10 miles, but was worried she wouldn't come close. Her knee was bothering her but it would let up at times. She kept the pace slow and easy. When she walked back in the door I could tell the run had not been a disaster since she was much happier. There was a little more science fair stuff left for me to do, then I turned over the data, the printouts, and some pictures to Jenny and she somehow miraculously got it put all together into something pretty amazing!! Forward Progress? - no, I don't think there was, I could be wrong though, but at least it was a nice weekend and Science Fair is over with! Thanks for stopping by my blog! 17.58 miles seems very FAR! I'm struggling with 6 right now. :) I look forward to following your running adventures. Whoa! Long run! We have been having very cold mornings here too - had to scrape off the car windows for the first time. Very cool about the guitar lessons - you guys will be able to have a band! @Clarinda - thank you for stopping by, I'm trying to get to all the daily mile people blogs, it's fun to see what's behind the quick blurbs that people post on DM. @Amy - it's funny, today was back to normal Florida warm and humid, but still in pleasant zone. I'm practicing bass every day, I think I'm getting a tiny bit better, hopefully the instructor will notice on Saturday..